All qualified veterinary surgeons must be Members of the Royal College of Veterinary Surgeons in order to practise in the UK. 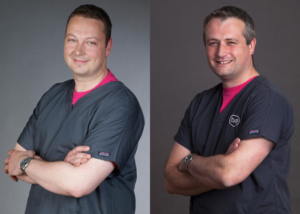 Members also have the option of applying subsequently to become ‘Fellows’ of RCVS and we are very proud to announce that Fellowships have been awarded to Simon Tappin (Head of Internal Medicine) and Jon Wray (Head of Cardiology) in recognition of their ‘meritorious contribution to clinical practice’. The main objective of RCVS Fellowships is to advance veterinary standards by providing a resource of independent knowledge for the benefit of the veterinary profession. Simon is a European and RCVS-Recognised Specialist in Small Animal Internal Medicine. He trained at the University of Cambridge and spent 2 years in small animal practice before taking up a Residency in Small Animal Medicine and Intensive Care at the University of Bristol. He joined DWR in 2007 and has been instrumental in developing the Interventional Radiology service, using minimally invasive techniques and bio-materials to treat many conditions which previously required more invasive surgery. John is an RCVS-Recognised Specialist in Small Animal Internal Medicine and holds the RCVS Certificate in Cardiology. Graduating from Bristol University, he worked in practice for 2 years, completed a Residency and held clinical and academic posts before joining DWR in 2008. Jon has been Chief Examiner for the RCVS Certificate in Small Animal Medicine and is currently Chief Examiner for the Diploma in Small Animal Medicine.